The stock RB26dett has a pretty unique arrangement for measuring the amount of air that comes into the engine. It has a dual MAF, or mass airflow meter. Most production cars have a single MAF, but for the RB26 Nissan decided to double up. The way they work, there is a heated element in a tube. Air passes over that heated element, and from the change in resistance, the amount of voltage varies. Since they can put out anywhere from 0-5 volts, it is not often that you will see a "CODE" or Check Engine Light if it is faulty. Watch out for cheap knock off MAF. There are many out there on the internet. You are better fixing your OEM sensor, or buying a used OEM than a new aftermarket MAF. If you car has what seems like a 2500 rpm limiter, it might have a MAF going bad. 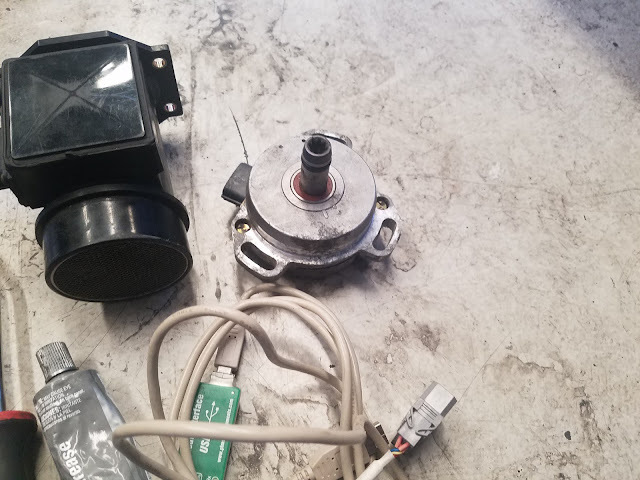 MAF - OEM part number: 22680-05U00 .The stock RB26 65mm(2.55 inches) MAF(Mass Air Flow) sensors are good for about 400 wheel horsepower. Above then they run out of range and max out their voltage. A popular replacement(in 2000) is the Nissan 300ZX meters. A 300ZX uses one MAF - we double up for the GT-R.They are physically larger(80 mm). More recently the R35 blade style MAF have become popular. With most stand alone engine management, cars generally go to a MAP(Manifold absolute pressure) sensor. The thing about MAP based tuning is that the density of air is dependent on temperature and pressure. Some ECU's swap over to MAP based load, but with the ITB's, it can be a difficult thing to tune for part throttle. The thing is, the mass air flow meter are probably 25 years old, or older now. Since they are one of the main inputs into the ECU to schedule fuel and timing, what they have to say is very important. Often we see the solder joints inside the MAF go bad. In this case, it is possible to open up the top, resolder, and you are back on the road. Check out these links below. 300ZX - Z32 MAF, 80 mm (3.15 inches). You need a new connector, you need tuning. Not plug and play unless you have a Power FC, or NISTUNE. They will do about 400 hp each, so will meter about 800 hp of air. R35 - There are drop in adaptors available. Even in black so they look near stock. Part number 22680-7S000. This is used on most current Nissan engines. Commonly referred to as the R35 GTR sensor but they’re actually used on everything from the GTR to the VK56 powered trucks and down to the lowly Tiida 4 cylinder. Nissan simply adjust the housing diameter to give them the required airflow range for the different engine sizes. Larger engines often use twin sensors. They’re good for around the same horsepower range as the Z32 MAF in a similar diameter housing but this can be adjusted by using different diameter housings. These are a custom sensor developed by Precision Mass Airflow Sensors in USA. More expensive than the Nissan sensor but good for big horsepower. New connectors are available for these and they come with a generous length of wire attached. More details below. Much more information at NISTUNE forum.